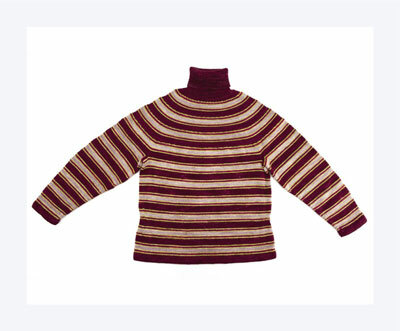 In this yoke turtleneck sweater, the stripes are repeated exactly the same way from garment bottom to top. 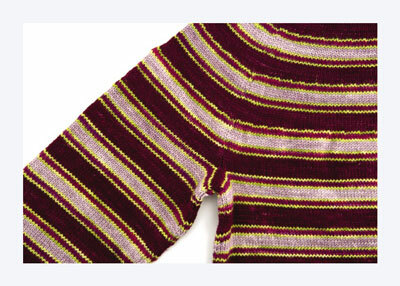 It’s the strategically placed decreases in the yoke that cause the stripes to bend into rings that circle the neckline. 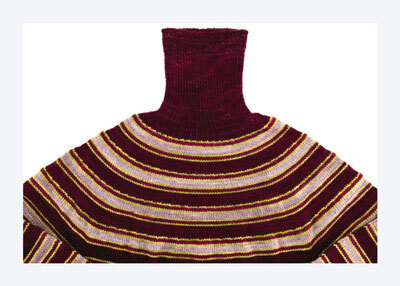 The solid turtleneck draws further attention to the wearer’s face. Waist shaping adds a feminine touch, and short rows worked at the back of the neck refine the fit of this simple silhouette. With smaller 24″ circular needle and MC, CO 228 (240, 252, 264) sts. PM and join for working in rnds, being careful not to twist. Knit 8 rnds. Purl 1 rnd for turning ridge. Change to larger needle and knit 8 rnds, knitting in hem on Rnd 8, if desired. You can secure a hemmed edge by sewing it in place with a needle and thread or yarn, or by knitting it in. To knit in a hem, fold the hem to the WS and work each stitch together with its corresponding cast-on loop from the lower edge. Beg with Row 9, rep Rows 1–20 of patt chart to end of yoke. At the same time, cont as foll. Place a second marker after 114 (120, 126, 132) sts. Work even in patt until piece measures 3-1⁄2 (4, 4-1⁄2, 5)” from turning ridge. Weave in yarn tails as you go; the job can seem daunting if you leave it until the end. Dec rnd: K2, k2tog, work to 4 sts before M, ssk, k2, sl M, k2, k2tog, work to last 4 sts, ssk, k2. Work dec rnd every 5th rnd 2 more times — 216 (228, 240, 252) sts. Work even in patt for 1″. Inc rnd: K2, M1L, work to 2 sts before M, M1R, k2, sl M, k2, M1L, work to last 2 sts, M1R, k2. Work inc rnd every 5th rnd 2 more times — 228 (240, 252, 264) sts. Work even in patt until piece measures 14-1⁄4 (14-1⁄2, 14-3⁄4, 15)” from turning ridge, ending with a Row 12 (14, 16, 18) of patt chart. Break working yarn, leaving a 6″ tail. Place 8 (9, 10, 11) sts from each side of each marker on waste yarn holders for underarms — 98 (102, 106, 110) sts each for front and back. With smaller DPNs and MC, CO 52 (54, 56, 58) sts. PM and join for working in rnds, being careful not to twist. Knit 8 rnds. Purl 1 rnd for turning ridge. Change to larger needles and work 8 rnds, knitting in hem on Rnd 8, if desired. 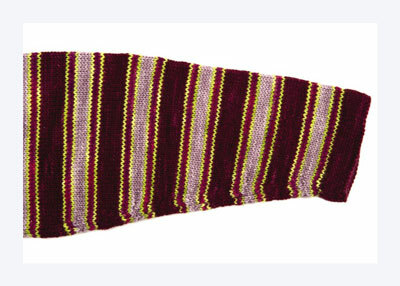 Beg with Row 9, rep rows 1–20 of patt chart to end of sleeve. 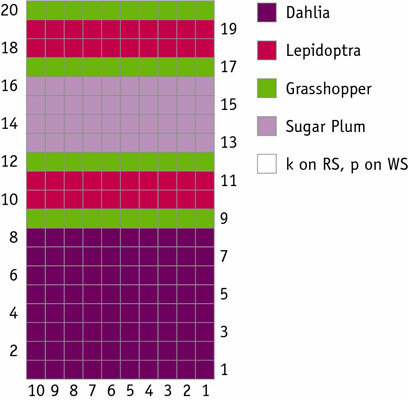 At the same time, inc 1 st at beg and end of every 5th rnd 17 (18, 19, 20) times — 86 (90, 94, 98) sts. Work even until piece measures 17-1⁄2 (17-3⁄4, 18, 18-1⁄4)” from turning ridge, ending with a Row 12 (14, 16, 18) of patt chart. Place 8 (9, 10, 11) sts from each side of marker on waste yarn holder — 70 (72, 74, 76) sts for sleeve. Place finished sleeve on a spare 16″ circular needle. Make second sleeve to match. All rnds begin at this point from now on. With larger needle and beg with left sleeve, rejoin working yarn and work from first st adjoining holder around to last. Work all sts of body front onto same needle. If you have a preference for which side of the body the side seam ends up on (for women, it’s traditionally the left), be sure to take note of where it is before joining the sleeves. 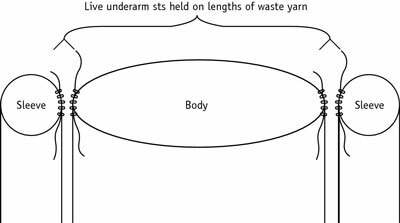 When you reach second set of held underarm sts, add second sleeve by working all sts from one side of held sleeve sts to the other. Work sts of body back onto same needle, PM at end of rnd — 336 (348, 360, 372) sts. Work even until body measures 16-3⁄4 (17, 17-1⁄4, 17-1⁄2)” from turning ridge. Dec rnd 1: *K3, k2tog; rep from * to last 1 (3, 0, 2) sts, k1 (3, 0, 2) — 269 (279, 288, 298) sts. Work even in patt for 2-1⁄2″. Dec rnd 2: *K2, k2tog; rep from * to last 1 (3, 0, 2) sts, k1 (3, 0, 2) — 202 (210, 216, 224) sts. Work even in patt for 2-1⁄2″. Dec rnd 3: *K2, k2tog; rep from * to last 2 (2, 0, 0) sts, k2 (2, 0, 0) — 152 (158, 162, 168) sts. Work even in patt for 2-1⁄2″. Dec rnd 4: *K1, k2tog; rep from * to last 2 (2, 0, 0) sts, k2 (2, 0, 0) — 102 (106, 108, 112) sts. 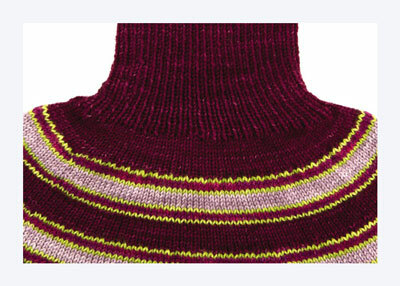 Short rows are inserted at the back of the sweater neck to raise it higher than the front for a better fit. Use coil-less safety pins or stitch markers to mark the end of each short row (the last stitch before you turn the work) so you don’t miss any when you work the neatening row. Work back neck shaping (short rows). 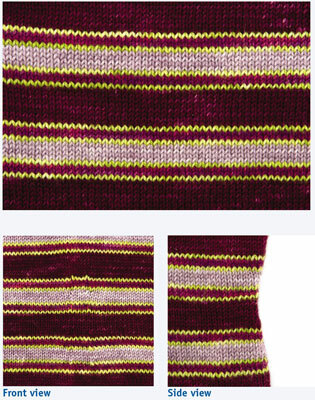 All the short-row shaping should be worked in MC to avoid interrupting the pattern. Set up for short rows: K11, PM, k51 (53, 54, 56), PM, work to end of rnd. Knit to 8 sts past M, turn work. Sl1, purl to end of rnd, then purl to 8 sts past M, turn work. Sl1, knit to end of rnd, then knit to 4 sts past M, turn work. Sl1, purl to end of rnd, then purl to 4 sts past M, turn work. Sl1, knit to end of rnd, then knit to M, turn work. Sl1, purl to end of rnd, then purl to M, turn work. Sl1, knit to end of rnd, then knit to 4 sts before M, turn work. Sl1, purl to end of rnd, then purl to 4 sts before M, turn work. Sl1, knit to end of rnd. Neatening row: Knit 1 rnd and, at the same time, as you come to each previously slipped st, pick up the st in the row beneath it and place it back up on the left-hand needle. Knit it and the slipped st together. 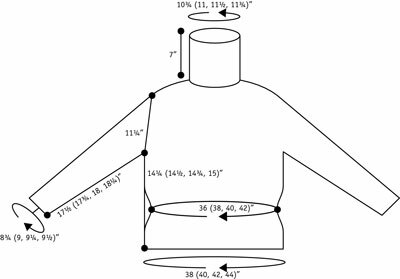 Work turtleneck: With MC, work in k1, p1 rib for 7″, or to desired length. BO loosely. To finish graft underarm sts using Kitchener st. If needed, turn hems to WS along turning ridge and sew in place. Weave in ends and block as desired.